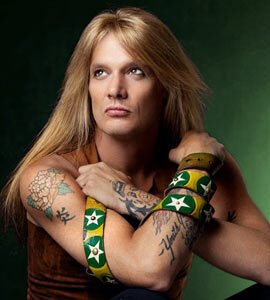 Sebastian Bach Biography, Discography, Music News on 100 XR - The Net's #1 Rock Station!!! Sebastian Bierk was born on April 3, 1968, in Freeport, BAHAMAS; his family moved to Peterborough, Canada when he was very young and by the time he reached his teenage years he fronted a string of local Rock outfits eventually changing his last name from Bierk to Bach. 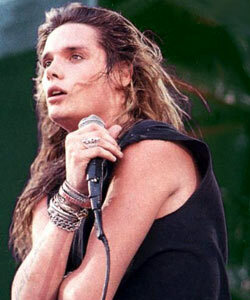 Sebastian Bach is perhaps best known as ex-frontman of the multi-platinum Pop-Metal band Skid Row. Sebastian Bach left Skid Row in 1998. His first solo outing, a live album recorded at the Liquid Room in Tokyo titled "Bring 'Em Bach Alive", was released the next year. His next album, 2007's "Angel Down", was his first solo CD since 1999's aforementioned live album and first release since 2004's "Forever Wild" DVD. Axl Rose of Guns N' Roses, joined Bach on a cover of Aerosmith's "Back In The Saddle" as well as on the first single off the record, "(Love Is) A Bitchslap". However sales of "Angel Down" were stagnant and it only reached #191 on The Billboard 200 although the album was supported by a tour with Bach's regular back-up band consisted of guitarists Mike Chlasciak and Johnny Chromatic, bassist Rob DeLuca and drummer Jason West. Sebastian Bach second solo studio record, "Kicking & Screaming", was released in September 2011, via Frontiers Records in North America. The recording featured new guitarist Nick Sterling as well a guest appearance by noted guitarist John 5. The album, which contained a minor hit single in its title-track, debuted at #73 on The Billboard 200. April 2014 sees the release of his next offering, "Give 'Em Hell". Joining Bach, guitarist Devin Bronson and drummer Bobby Jarzombek in the studio were special guests Duff McKagan, John 5 and Steve Stevens. Ahead of the album's appearance was released the video for the lead track, "Temptation".